LB-1960 Binocular Operational Microscope for ENT and Ophthalmology (Ophthalmic Microsurgery) is a coaxial illumination binocular operation microscope for one person, compact, portable and flexible. It can meet general requirements of ophthalmic microsurgery. Binocular operation microscope designed for one person, can meet the requirements of general ophthalmic surgery. Germany optical lenses are all multi-coated. Image is clear and view field is even. 6°+0 coaxial illumination provides the red reflex, lens posterior capsule can be observed, so as to reduce the risk of surgery. Radius of microscope arm increases to 1030mm, which provides larger operation range for the surgeon. Universal structure/stand to support the microscope head up and down, left and right movement, more application area. Position lock screw can protect the arm at any location from moving. 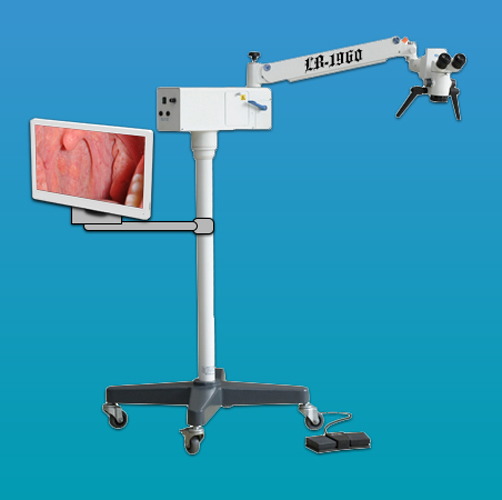 It is portable, compact and is mainly applied in clinic, hospitals and mobile hospitals for Ophthalmology, ENT and areas like these.